Sunless tanners are much more popular now than they used to be due to the improvements that the manufacturers have made. Sunless tanners are just what they sound like; tanners that work without the use of sunlight. We looked at 20 of the top sunless self tanners on the market and checked them for color accuracy, time of maturation, strength of scent, customer feedback and other considerations. The three sunless tanners reviewed below all topped the list in these categories. They are definitely high quality products that will produce the kind of results you want. Sunless tanners come in many different forms and brands and they are definitely not all created equally. Using sunless tanners lowers the risk of sunburn and skin cancer because the skin isn’t exposed to the UV rays that are so damaging. Remember that sunless tanners are not the same as sunscreen and will not keep you from getting burned if you are out in the sunlight. There are several things you need to keep in mind when you are searching for the right sunless tanner. We will help you understand these important factors so you choose the right sunless tanner for your needs that will produce the kind of results you are looking for. Sun Laboratories is a well known manufacturer of sunless tanning products. This ultra dark sunless tanning lotion helps users achieve a natural tan on your face and body. In just three hours you will have a deep tan that leaves a beautiful bronzed look. This all natural product is very hydrating to the skin and will not dry it out. 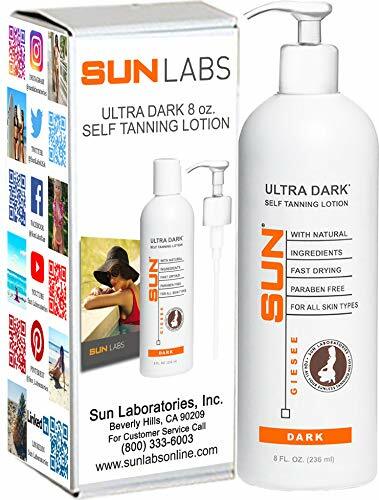 The color you will achieve when you use the Sun Lab’s sunless tanner is instant and prevents patchiness or streaking like many sunless tanners do. All skin types can safely use this paraben free product to achieve the color they want to achieve. 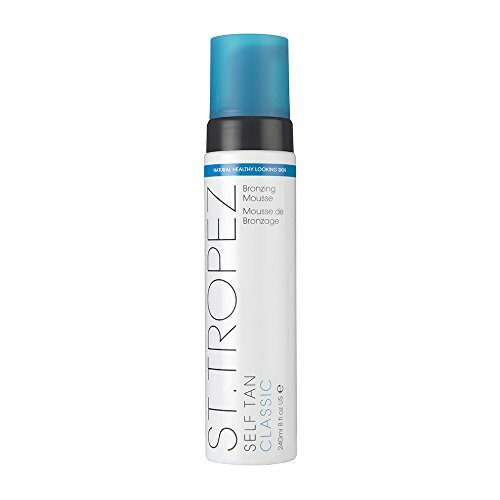 St Tropez brings a great sunless self tanner in the form of a lightweight mousse that dries in less than a minute and allows users to achieve a gorgeous bronze glow. It is easy to apply and tinted as well. This product was the winner of the ELLE Beauty Awards and In Style Best Beauty Buys Winner as well. There is none of the offensive self tanning smell that is present in lesser quality products and it is streak free too. Application is super easy with the applicator mitt and all you need to do is wait 1 minute before getting dressed after applying it. This product has eco-cert approved DHA. St. Tropez will provide a natural tan that is streak free and that fades evenly, looking natural even as it fades. Dave’s Sunless Self Tanner has won numerous accolades from many different sources including Cosmo, Now Magazine, Marie Claire and others. This company has produced many highly rated sunless tanners that have converted even the most hardened of skeptics. One of the major differences about Dave’s Tanners is the ingredients it DOESN’T have. It contains no Stearic Acid, Mineral Oil or Triethanolamine. These ingredients are what causes the self tanners to turn people orange. The company’s primary goal is to provide the most moisturizing and silkiest tanner on the market. They are routinely tested for over two years before they are ever presented to the public for sale. Another special feature of Dave’s sunless tanner is that it contains anti-aging, moisturizing and firming ingredients that improve the skin with use. There is no awful scent with this product as well and it works for men and women equally well. Many people are addicted to tans because they make the skin look so much better. The problem with lying out in the sun to get this look is the damage and lasting effects it causes on the skin, especially long term. Sunless tanners help achieve the desired color while reducing the risk of skin conditions that are caused by the sun. The three products reviews above are all customer favorites and are very good in terms of giving natural looking, streak free color. Sunless tanners may have a bit of a learning curve when it comes to application but once you get the application down, you will have great looking color with no streaks and most importantly, no skin dangers. You can learn even more about choosing the right sunless tanner for your needs by reading the buyer’s guide below. It contains what you need to know to sort through the pretenders and choose the high quality products that won’t leave you feeling disappointed. There are many different forms of sunless tanners on the market today. People who use these tanners have preferences over which type they like the best. Since this is largely a personal preference choice, read below to learn about the different forms to see which one appeals to you the best. We have listed the different forms that sunless tanners typically come in. Bronzers – This type of tanner acts more like makeup than a tanner. They work immediately with no gradual developing of color. They wash off so the effects of a bronzer are not for the long term user that doesn’t want to mess with application every single day. They are good for when you need a fast burst of color but for long term use they can be very expensive. Lotion – Sunless tanning lotion is probably the most common form of self tanner. They will often contain DHA which works to increase the body’s natural melanin which is found in the skin’s cells. It is that increase that darkens the skin. The potential problem with lotions is that they can increase skin sensitivity which can increase the possibility of burning when out in the sun. Spray – Sunless tanning spray is another form that self tanners can come in. This is another product that contains DHA for maximum effectiveness. The top layer of skin will darken with the use of this type of product. It is applied to the skin through a mist either in a professional environment or at home. Spray sunless tanners usually last about a week or so. There are some sunless tanners that have added ingredients that work well to moisturize and hydrate the skin. Buyers should compare the ingredients that are in the sunless tanners they are interested in to see whether the benefits are going to be worth it. Moisturizers – including oil based – Reduces the dryness of the skin and can reduce the effects of any harsh chemicals. It is also great for keeping the skin soft. Skin Rejuvenating – This will reduce any signs of aging as well as add much needed moisture to the skin. Anti-Inflammatory – This will reduce redness in the skin by reducing skin inflammation that is caused by harsh products, ingredients and the sun. Healing – Healing ingredients are used to remove the free radicals from the skin to promote healing from itching, drying, flaking and other skin problems. Time of color maturation – each product will have its own specific time that it takes to develop the proper color. When bronzers are used, the color will be instant and will come off just as fast when you shower. Some tanners take about 30 minutes to start seeing color and others can keep developing color for up to 8 hours after application. Depending on the product, they will last anywhere from a couple of days to as long as a week or more. The bottle will tell you what to expect and customer feedback can tell you the rest. Sunless tanners for the body – One of the best ways to ensure a good self tanning experience is to shave and exfoliate BEFORE applying the tanner. If you do these things after the tanner it could fade much faster than if you do it before. Another positive thing to do is to moisturize after you have applied the tanner and it dries. Self-Tanners for the Face – One of the biggest problems to watch out for when using sunless tanners on your face is the fragrances they may contain. Fragrances can cause skin irritations and rashes to develop on the face or anywhere else on the body too. If you have sensitive skin, especially on your face stick to the unscented varieties that have as little ingredients as possible. Don’t mistake sunless tanner for sunscreen. The sunless tanners will not offer any protection against sunburn if you are outside and in some cases can even make the sun sensitivity even worse. Exfoliate the skin before applying the sunless tanner. This will help the resulting tan be much more even and natural looking. It is also advisable to shave and apply moisturizer to the knees, elbows, wrists and ankles. Apply sunless tanner in sections and massage it in using circular motions. Many sunless tanners have application mitts that are sold with the product and sometimes are purchased separately. They help the application process be much smoother. Be careful around knuckles, the tops of the feet, hairline, and ears when applying sunless tanner. These are places that are much more difficult to get correct with a sunless tanner. Wash your hands in between each application. If you are only applying one application, be sure to wash your hands after that one as well. Use soap to re move the traces so the palms don’t stain. If you can find excellent quality sunless tanners that have UV protection, those are good choices to make. This will help protect your skin from sunburn and will reduce the risk of sun damage as well. If you can’t find a good sunless tanner with UV protection, make sure you purchase a good quality sunscreen to use separately from the sunless tanner. You should apply the sunless tanner first; allow it to dry thoroughly before applying any sunscreen. If you want to look like you spend a lot of time laying out by the pool but you don’t want the leathery, aged look that too much sun exposure can cause, then what you want is a high quality sunless tanner. With all of the sunless tanners on the market, it can be a real challenge to figure out what the truth it when it comes to claims of being the best. The three products that we have featured above are all great examples of high quality sunless tanning products. They all have high customer reviews and have been proven to provide users with a great looking tan that users won’t have to feel worried or guilty about. Remember that sunless tanning products take a little bit of skill to apply correctly. Take your time, exfoliate and shave before you apply the tanner, wash your hands right afterwards for a t least 30 seconds with soap and you should end up with a tan that others will envy and think you’ve gotten while on vacation at the beach. If you take the time to sort through the poor quality self tanning lotions and the high quality products that provide excellent color, you are guaranteed to find a product that you will like using and that others won’t be able to tell is a self tanner.